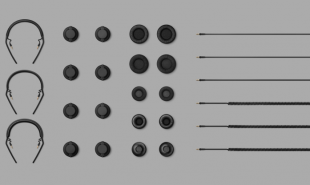 Headphones have never been a one-size-fits-all product: different users require not only different shapes, sizes and styles, but different sound qualities as well. We have already seen OwnPhones, which use 3D printing to create customized, perfect fit earbuds, and now Danish audio design company AIAIAI has created a modular headphone system with 360 variations, which enables consumers to adapt the companies TMA-2 headphones to suit their personal needs. 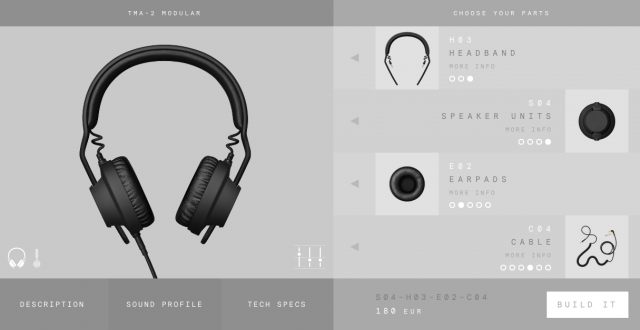 Users can build their own headphones, choosing from a range of speaker units, headbands, earpads and cables depending on their preferences. AIAIAI have put together an interactive guide with a huge range of suggested combinations based on different variables. Customers can browse the best combo for a specific genre, look for the most comfortable setup or combine the best headband for on-the-go listening with the bassiest speaker unit. They can even turn to one of the site’s artist recommendations. The site itself is a beautiful, comprehensive experience which guides the consumer through their choices, enabling them to adjust presets and providing information about each modular part as well as the combined effect. Prices vary depending on parts, but usually end up at around EUR 230. Are there other products which could be broken down into variable parts in this way?